Inset map shows the range of the Chumash, Gabrieleño, Fernandeño, Vanyume and Tataviam cultures. The latter was known at the time as Alliklik (or here, I'Allikuk). On May 2, 1884, brothers McCoy and Everette Pyle, a pair of young ranchers, stumbled upon Bowers Cave in the Hasley hills behind Castaic. 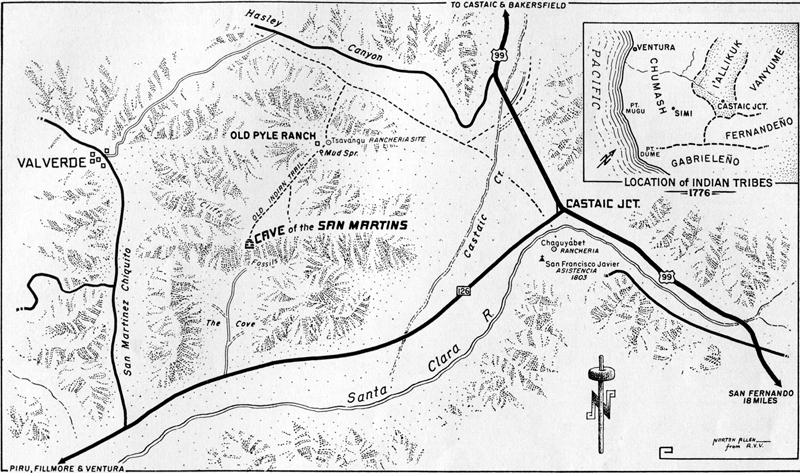 Inside they found a treasure trove of native American artifacts, believed to have been deposited there by Tataviam Indians, the dominant peoples of the Santa Clarita Valley from about A.D. 450 to the early 19th Century. Among the artifacts were nine baskets [Elsasser & Heizer 1963]; 15 complete and another 18 partial flicker (and other) feather bands [ibid. ]; 45 bone whistles, various bullroarers and other items [ibid. ]; and four ritual staffs or "sun sticks" — perforated stones mounted on 45cm (approx. 18-inch) wooden handles [Johnson: pers. comm. 2013] — which were likely used in the Winter Solstice ceremony [Benson 1997:32]. According to Van Valkenburgh , the Bowers Cave artifacts constituted "some of the most famous Indian material ever to be discovered in the United States" inasumch as the hoard included the only perforated stones that were still attached to their original wooden handles when they were found. Nothing so important had ever been unearthed in connection with the Tataviam. Sold to Dr. Stephen Bowers, for whom the cave was named, most of the collection found its way to the Peabody Museum of American Ethnology at Harvard University. In 1952, the Peabody traded one of the ritual staffs to a museum in Australia [Blackburn & Hudson 1990:45] — traded for what, we don't know —; the bulk of the collection is still at the Peabody. Bowers Cave is located within the boundaries of the Chiquita Canyon Landfill property, near its northeastern border. An approved (2017) landfill expansion was required to avoid the cave and is unlikely to disturb it. Read Van Valkenburgh's 1952 story of his rediscovery of Bowers Cave here. Read Jerry Reynolds' 1984 story about Bowers Cave here. Image 1952f: 9600 dpi jpeg from magazine page.